Large enterprises perform supplier governance for complex services in silos – segregated by department, contract, geography or type of service. This fragmented governance approach and the absence of integration between the underlying support systems result in signifi­cant value leakage. 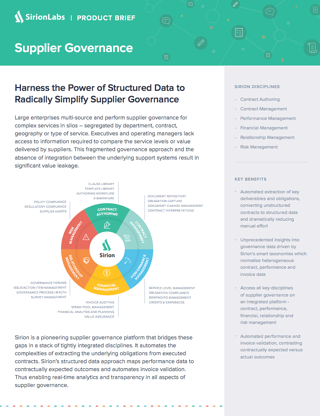 Sirion is the industry’s first supplier governance technology that enables management of all key supplier governance disciplines – Contract, Performance, Financial, Risk and Relationship Management on a single, integrated platform. With powerful functionality such as automated obligation extraction, advanced analytics, configurable workflow, and the ability to integrate with adjacent enterprise systems, Sirion enables validation of supplier performance and invoices against the underlying contractual obligations thereby eliminating leakage and driving higher value realization. Download this product brief for detailed information on Sirion’s functionality and benefits.